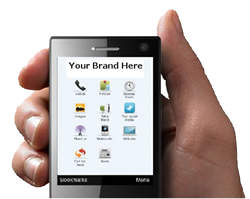 Create a cost efficient, high quality mobile website for your business in minutes with goMobi. goMobi delivers an attractive and easy-to-navigate mobile site with features that will increase mobile conversions and generate revenue such as clickable phone numbers, maps and location-based directions, reservation and request information forms, ability to share site content via social media, coupons, QR codes and mCommerce. Create great mobile websites quickly and easily! Mobile-friendly features make it easy for customers to find what they’re looking for and convert leads into sales. It works on all phones, including smartphones and other connected devices like tablets. It even looks good on desktops! Most website does not support in mobile phone. They are slow to load and hard to view. Designed by dotMobi, makes your business easily for mobile users with fast and easy to view. NO. You can use any domain or a Third level domain is provided FREE. You can just point it to your mobile site. Access to user-friendly goMobi Set Up Assistant to create your site in minutes. Try it FREE for 1 Month at No COST! For 30 Days FREE try, please use coupon " GoMOBI"